The Rudrabhishekam Puja is for Lord Shiva in his Rudra form. It is hailed in all Vedic scriptures as one of the greatest Pujas to remove all evils, to attain all desires, and for all around prosperity. It is an excellent remedy for all doshas. Rudrabhishekam is typically performed at sunset (Pradosham) to worship Lord Shiva as he performs the holy dance in Kailasam. 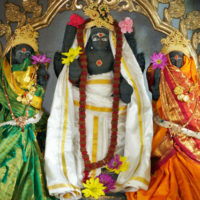 All Devatas (gods) assemble there to watch this holy event, and offer their prayers to him. Therefore this Puja offers the benefit of having worshiped all the deities at one time. 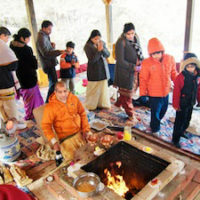 According to the Veda, thinking and meditating during sunset is also considered most sacred. 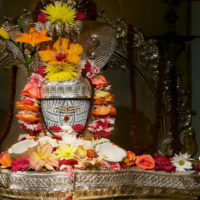 For further information about Lord Shiva and his blessings, please click here. 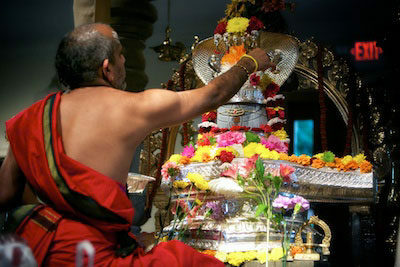 March’s Puja is replaced by the annual Mahashivarathri Rudrabhishekam on Monday, March 4th.